This is the extended version. There is a shorter 3-step version available here. Very few audio or video systems are dead quiet. There are usually always a few hum related problems. If your system has a bit of hum , is it the transformer or a ground loop? How do you determine the source of hum and what can you do about it? Sometimes hums and buzzes are quite obvious, sometimes not. The ‘hum noise’ usually comes in two flavors, a low non-irritating drone (50 or 60 Hz) or a slightly higher pitched buzz or raspy/irritating ‘angry insect’ sound (100 or 120 Hz). Video hum is usually seen as diagonal bars across the TV or screen of a projector. The low non-irritating drone hum is usually internal to the equipment and is mechanical in nature. The higher pitched and more irritating ‘buzz’ is typically found emanating from the loudspeakers and is usually caused by a ground loop. The most common cause of hum is the ground loop – fortunately it is also the easiest to solve. First, you should determine the type of hum you are dealing with. There are two basic types: 120Hz buzz, typically caused by ground loops, and 60Hz hum, typically a result of poor shielding, cable problems, or close proximity to strong magnetic fields. To determine which of these you have, listen to the two examples. 120Hz hum/buzz typical of ground loop problems. We first need to divide our search into two categories; mechanical or electrical induced hum. A mechanically induced hum or buzz is equally easy to determine. Place your ear very near to each piece of your electrical equipment and again, listen for hum and buzz. If you hear a hum emanating from within your equipment, we would refer to this as mechanically induced noise (as opposed to an electrically induced noise). To see if it is an electrical problem, make sure your system has been on and warmed up for at least 10 minutes, then simply place your ear near the loudspeaker (with no music playing) and listen to determine if the hum or buzz is coming from your speaker. If it is, then at least one component of your problem is electrical. This is the most common and usually caused from a ground loop. Ground loops hums are perhaps the most tedious to track down – yet they are by far the most common. You typically have a ground loop when the hum or buzz comes out of your loudspeakers. Ground loops are a result of differing ground potentials. This means that the ground of one AC source or equipment source is at a different level than the ground of another AC source or equipment. This difference is usually amplified in the form of audible or visible hum. Visible hum is usually seen as diagonal bars across the video screen. Tracking these types of hums down is more difficult and below we have assembled some helpful tips. It is critically important you follow these steps one at a time and don’t miss any. The easiest way to figure out where ground loop problems lie is by the process of elimination. You need to determine where the hum or buzz is coming from within your system. If it’s a video hum problem, use a known good source like a DVD player rather than cable or satellite. In video, it’s best to always assume that it’s either a connection problem or, more likely, a cable problem. Our experience has shown that poorly shielded video cables cause more hum problems than just about anything else. In an audio situation, the first suspect in our hunt would be the power amp or the receiver that is driving the loudspeaker. To see if the power amp or the receiver is the culprit, turn them off, disconnect its inputs and turn it back on again. Go back to the speaker and place your ear in close proximity to see if the hum is still there. If it is, then you have a problem with your power amp or receiver and you should seek help from its manufacturer. If the hum/buzz goes away when you remove the inputs to the power amp, your next step will be to reconnect the amp and move further down the chain. If you were working with a receiver or an integrated amplifier, you will need to jump to step 4. If you have a preamp, or processor that is feeding the power amp, your next step would be to disconnect all inputs to the preamplifier or processor. Once these are disconnected, and the preamp or processor is connected only to the power amplifier, turn the system on and again, listen for hum. Should the hum now appear, it is a problem with your preamp or processor or their interaction with the power amp. Before returning the preamp or processor to the manufacturer, try a cheater plug to break a ground loop. Cheater plugs are simple devices that convert a three prong AC plug into a two prong AC plug and in the act of converting three prongs, to two prongs, they disconnect the ground from the wall socket. Try one of these on the preamp, or the power amp, or both. 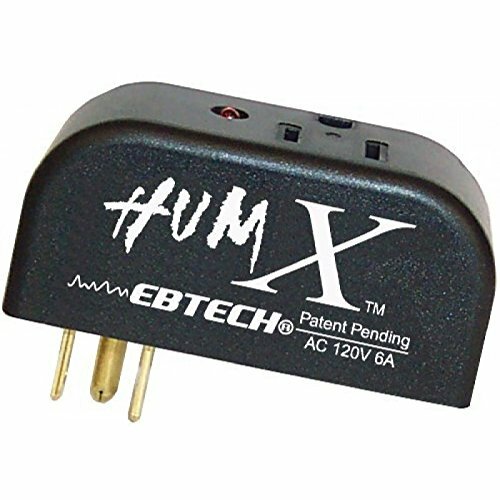 If an AC cheater plug work, replace it with a HUM X. Using a cheater plug may not be the safest alternative. If you determine that there is still no hum present when the preamp, processor or receiver is connected with no inputs, then selectively begin plugging in your various inputs one at a time. After each connection, check for hum until you discover the humming culprit. VCR’s, surround processors, and any device that is connected to a television cable or satellite dish can cause a loud buzz and should always be suspect. If, by the process of elimination described above, you determine it is a component like a VCR that is causing the hum/buzz to occur, and using a cheater plug or removing the ground pin on a PS AC Series Power Cable doesn’t help matters, it may be necessary to isolate the cable connection (CATV) with an isolation transformer. This inexpensive device is available at most Wal Mart, Radio Shack or department store type outlets and is sometimes called a ‘matching transformer’. If you have problems finding one, call your local cable TV company for advice. The matching transformer will be placed between the cable TV cord and the VCR, TV or processor. Here’s an example of a good isolation transformer you can purchase online. Just remember, take the system down to its simplest level of connection. Find a way to hook the system up with as many pieces of the system missing or not connected. Keep it simple and get it to the point where the hum’s gone. Then start adding back components one at a time until the hum returns. If it’s mechanically induced hum/buzz it is usually heard coming from inside the equipment. The causes for this are poorly designed power transformers and/or DC on the AC line. The PS Audio Power Plant series can remove DC from the AC line if that is the problem. Mechanically induced hum is caused, almost entirely, by the transformer. If you suffer from this noise problem, you’ve probably also noticed that it’s intensity varies depending on the time of day, sometimes even the time of month. The reason it varies is due, in large part, to the quality of the AC line voltage, the construction of the transformer and how much DC is on it. We could use the tired saying ‘because they don’t know the words,’ but that might get us sidetracked. The short and simple answer is that transformers hum because of an effect known as ‘lamination rattle’ caused by DC voltage on the line or poor construction or both. ‘Lam’ rattle occurs in all transformers to some degree, that degree being related to the quality of the transformer and the quality of the line voltage. Finding the problem is 9/10th of the work in finding a solution. I am trying to get set up to capture high-quality audio from various sources (tapes, records, etc.) onto computer. To this end, I have bought a Behringer UMC404-HD, which seems like a really nice toy. Unfortunately, I am struggling with a powerline hum of a sort which sounds to me like your example of a ground loop. If I capture audio with nothing plugged into the interface, it is, as expected, absolutely silent. If I connect the interface to my turntable (a Thorens TD 318 I inherited from my dad), then it ‘works”, capturing good-quality audio, but with a harsh 120hz buzz sitting beneath the audio. It is usually a pretty quiet buzz. I originally had a separate preamp (an AMX AP-25) in between the turntable and the interface. The hum was significantly worse with this. The AP-25 is powered by DC from a switch mode transformer, so I don’t see how it could be exposing it to the AC frequency. In trying to diagnose the problem, I also tried unhooking the cable from the turntable, so that the interface just has the two cables dangling from it loose, unattached at the other end. In this arrangement, the 120hz signal gets MUCH louder, but loses its harsh quality — I’d call it a 60hz hum instead of a 120hz buzz. The interface is also powered by a switch mode power supply, so again, I don’t see where the 60hz signal is coming from. Moving the cables around, whether connected or not, doesn’t seem to have any effect. I don’t see a way for this to be stray interference the cables are picking up from passing next to a power cable. Nothing is hooked up to ground as both the turntable and the interface are powered by DC. Clearly you have a ground loop or a missing ground wire. The telling scenario is that the interface alone is quiet. Good detective work. The cables dangling on their own should hum like that so that’s no help. Try connecting everything back up and then get a length of wire. Connect the one end of the wire to the ground post on your preamp or AD converter. With the other start poking around the turntable, arm, etc. to see if it helps. Thanks for your reply 🙂 I’m still confused as to how ground noise is getting into this at all, since neither the turntable nor the interface unit are actually connected to mains. They’re both receiving DC voltage converted with a switch mode power supply, and thus neither one has any link to AC power operating at 60Hz, whether directly or through a ground circuit. There is a separate wire, though, dangling from the back of the turntable. It has a little fork connector at the end that is clearly intended to be fastened beneath a screw somewhere. The manual for the Thorens TD 318 says that it should be attached to the common ground of the amplifier, but in this case, the only amplifier is the pre-amp built into the USB audio interface, and that unit does not have a ground (as far as I know)! How do you hook up a ground when nothing in the circuit is grounded? Note that apart from the ground wire emanating from the turntable, none of the components actually _have_ a ground of any sort, as far as I can tell. You can always attach that ground wire to earth ground to see if that helps. The easiest way to get earth ground is through a three prong to two prong AC adapter called a cheater plug. These adapters typically have a wire or screw allowing use of a wire tying to ground. Not sure if this will help but worth a try. BTW, your SMPS is creating its own ground. I’m not an expert, but my understanding is that the ground on the output of a wall wart is completely isolated from any ground on the input, right? For starters, wall warts don’t even typically _have_ a ground pin on the input. The ground for the DC output wouldn’t have any association with a 60Hz signal on the AC line, would it? I will try connecting the ground line from the turntable to the house’s earth ground and let you know what happens. 🙂 Thanks! I have a new hum introduced into my home theater system. The addition of an Nvidia Shield TV media server and an Amazon Fire Stick each individually cause a hum through my speakers. It sounds like a 60hz hum. The hum is the same loudness regardless of the volume setting. The hum is there over 90% of the time, but can be intermittent. It has gone away for a few minutes to a few hours, but always returns. I have a Sherbourn PT 7020 Pre/Pro connected to an Outlaw 7700 7 channel power amp with balanced XLR cables. They are both plugged into a Furman power conditioner. The Nvidia and Fire Stick each cause a hum when feeding the amp. There is no hum when they feed the TV directly. Every other source, including several different blue ray players, never caused any hum in 10 years, only with the Nvidia Shield and the Amazon Fire Stick. I did quite a bit of troubleshooting. At the simplest setup, I had the power amp, the pre/pro and Nvidia Shield all plugged into the same outlet. Nothing else connected. I even unplugged the TV and disconnected it from the pre/pro. I used “cheater” plugs to remove the ground. I turned off every other breaker in the entire house. The hum remained. I swapped out the Nvidia Shield and plugged in the Amazon Fire Stick instead. The hum was reduced but still remained. I also tried removing the power conditioner, no change. The next thing I did was swap out the 7 channel Outlaw amp for a Nakamichi stereo amp. The hum was gone. I would think that indicates a problem with the Outlaw power amp. So any ideas, does this point strongly to a problem with my power amp? Should I take it to a shop? Anything else I should try? I wouldn’t be so quick to blame the power amp if it is the connection of the two sources that cause it. If I am understanding correctly, when the Amazone Fire stick is added or the media server there’s hum and without them there’s not? That sounds to me more like a ground loop the the Nakamichi is not prone to and the Outlaw is. If I do have a ground loop, what else could I try to deal with it? I’ve already had all 3 items plugged into the same outlet, with the pre/pro and power amp connected with cheater plugs (and directly connected). The Nvidia Shield and the Fire Stick both use 2-prong power cords, so no ground connection at all on the only 3 components I had connected. If I did try that, would it go on my power amp, pre/pro or the Nvidia Shield? Would I need more than one to be really sure? Would a UPS eliminate any possible ground loops? A UPS will provide nothing for you. It’s hard to know if the HumX will help but it might be worth a try and return it if not. The trick with hum is to find out through the process of elimination as detailed in the above article which is making the hum. It can be tedious. Hello, I have an onkyo tx 8050 and a project debut carbon record player. I get a buzz noise when on the phono inup only, all other input are quiet. We just recently moved into this new house and buzz started then, didn’t buzz at old house. Record player is the only thing hooked up to the receiver. I have the ground hooked up from the receiver to record player. I ran a ground from the back of the receiver to the ground on the power strip and that eliminated about 50% of the buzz but there is still some left. Sounds to me like a grounding issue or dirty power. Wonder what I can do to get rid of the remaining buzz. Think that humx would help? Or a certain type of surge protector would help? I have 2.1 system and the right speaker keeps buzzing.No audio just buzzing.The other one and the bass are fine.No matter how i connect them the problem remains. (Speaker 1–>right: buzzes,speaker 2–>left:fine OR Speaker 2–>right buzzes,speaker 1 left fine).So speakers are fine and i think there is something wrong with my amplifier..The buzz is the same and constant no matter the volume on my source or my amplifier and it doesnt stop if i unplug the input.What could possibly be wrong here? From the sound of it you have an amplifier problem. Can you try another amplifier? We’re talking about guitar setup, pedalboard and amp. Everything has been doublechecked and standard things are not involved, so no ground loop no bad power line, this noise is already audible with guitar just plugged directly into my amp. I’ve 3 guitars and 2 amps, in every outlet with every permutation is present and is absent with noise cancelling or humbucker pickups, so it’ something “outside” my instruments or effect chain, present far or near from them. Using a spectrum analyzer the root frequency seems around 2402Hz, with harmonics at 1802Hz, 2100Hz and 2701Hz. It’s present in all part of the day, so no public lights involved, no elevator engine or else. What could be? Does that frequency range is related to some public utility, generating that noise footprint? Single coil pickups hum. It is unavoidable. If you turn on more than one pickup the hum will go away. I have a TA-D505 Sony Stereo Amplifier and a PS-D705 Sony turntable. I get a quite loud 120 buzzing coming from the speakers when i select the turntable input. While the CD and the tape inputs are far less noisy. I think it’s a ground loop. But I really don’t know where to connect the ground cables or what to do to reduce the buzzing. The turntable doesn’t have ground cables (as far as i know). My 60 Hz hum is evident when the receiver is off and the powered subwoofer is left in standby mode. When the receiver is on, or when the subwoofer if off, no hum is detected. I have tried plugging the receiver and the subwoofer many ways. Right now, they are on separate power strips and separate outlets. Both pieces are in the same room and I am sure are on the same circuit. Any suggestions would be appreciated.